Click the button below to add the Eternal happiness necklace for lovers to your wish list. This necklace is the Chinse character for eternal happiness. It is often seen in weddings. Check out the matching earrings. It's super easy to put on and off, and the chain is comfortable against skin. Yunnan is noted for a very high level of ethnic diversity. Some 38% of the province's population are members of minorities. Many people still prefer to live in villages where employment and educatioinal opportunities are limited. 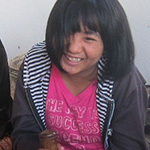 We buy directly from Yunnan Gushu, a Yunnan village producer group that is jointly owned by crafters. They often make use of local materials, and their designs have very strong cultural elements. Minority groups celebrate strong personalities through vibrant colours and outstanding accessories. We challenge you to try some on!